I saw the show with my own Ariel, who’s 16, shares the mermaid’s name …. I was delighted she wanted to see it with me — not least because of what The Little Mermaid says about women, under the sea or above it. You have to hand it to Disney, purveyor of the dependent Cinderella, now championing girls who seek to take charge: Pocahontas, Beauty and the Beast‘s Belle, and Ariel. “Bright young women, sick of swimmin’, ready to stand,” is how Ariel sings it, and how I hope my Ariel will sing it, too. Pardon me? Which mermaid is he talking about? The Ariel I remember abandons her family and friends to chase a pipe dream in a different ecosystem. She may be portrayed as a young woman who refuses to settle for less — whatever “less” is (presumably safety and a home and wealth and her pick of the merman litter!) — but in fact, she stops at nothing to become what she is not. After she rescues the prince from drowning and he sees her face and falls in love with her, she does not insist that he love her for who she is. She wins in the end by transforming herself into something more like other people, to fit in, to abandon herself to appeal to someone else’s sensibilities. Maybe the prince would love her as a mermaid. Will she ever know? Does she ever come clean? No: She is a fraud. She may trade her voice for those legs, but she gets it back in the end — and she gets to keep the legs, too! What has she sacrificed? Not much. She has nothing of the integrity of the original Hans Christian Andersen mermaid, who at least pays a price for her alteration. For her, getting her legs feels like a sword cutting through her. With every step she takes, it feels like she’s walking on sharp knives. The sea witch takes her voice by literally cutting out her tongue! 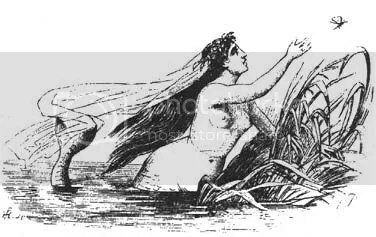 Before she does her magic, the witch even warns the mermaid about all that will happen. She tells the girl she is a fool for going through with it, but the mermaid ignores her. Despite all the suffering, Andersen’s mermaid loses everything. The prince marries another girl, and the mermaid dies and is transformed into sea foam! It is terribly sad. In her losing, Andersen’s mermaid becomes a kind of martyr. The story plays like a morality tale. She is portrayed as a mere foolish girl, and she is punished in the end for reaching too far. (How dare she have self determination!) But the lessons from Disney’s red-haired Ariel aren’t exactly any better. Andersen’s mermaid doesn’t simply want the love of a human prince. In the old story, though merfolk can live to be 300, they do not have immortal souls as humans do. It is the prospect of eternal afterlife with her prince, even if her earthly existence is cut down to a human scale, that truly motivates her. Say what you want about coercive religious subtexts or whatever, this is at least a higher-minded reason to crawl ashore than to find out what a snarfblatt is or how a dinglehopper works. The quotation above was used in a full-page, full-color ad in this Sunday’s New York Times, where I first saw it. Without doubt The Little Mermaid is a fun movie. In fact, I love it. And I’m sure the Broadway show is equally delightful. But it’s bizarre and backwards that parents should put such stock in Ariel as someone for their daughters to mimic. What exactly are these fairy tale movies teaching kids about life? Don’t love who you are. Success is only possible if you make irreversible changes to yourself to be more like other people. Being different is wrong, and it must be corrected at any cost. “You have to hand it to Disney”? As if Ariel is some great improvement on the typical Disney princess? All you have to hand Disney is your money. Ariel is more free-spirited than Cinderella, true. Bookish Belle improves on the theme by being unafraid of what makes her different from others around her. Belle is actually a far better example: She is compassionate toward the beast and finds something dear in him. And to her credit, she falls in love with him before he turns back into the hottie prince. Jasmine is even more fiery and independent, to the point of being shrewish. But in the end, their happiness all depends on marrying the right guy.